Eat well and stay active - but still find the last of the ‘baby bulge’ still prevents you from wearing the clothes that make you feel your best? Abdominoplasty and mini tummy tuck procedures remove the loose skin and post-baby pouch that can affect women’s confidence after pregnancy. How a woman feels about her body after pregnancy is deeply personal. Her physical identity should not be influenced by society, media, friends - or anything other than how the woman wishes to see herself. What is the difference between a full abdominoplasty and a mini abdominoplasty? Generally, a standard abdominoplasty involves the reconstruction of the abdominal wall by rejoining the stomach muscles, removal of any hernias and then the reduction of excess skin, with the umbilicus replaced in a new, higher position on the abdomen. Functionally this improves core strength, and aesthetically it provides a flatter, more sculpted abdomen. 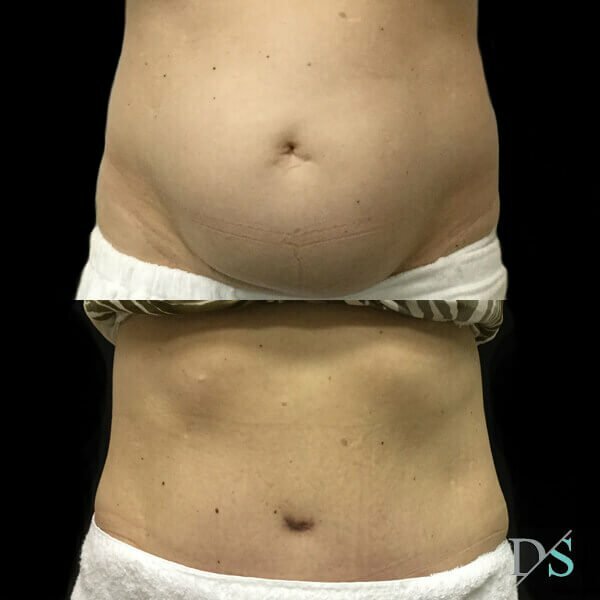 A mini tummy tuck only involves the removal of a small pocket of excess skin on the lower abdomen and is appropriate for women who do not have muscle separation, hernias or loose skin around their umbilicus. How long after giving birth should I consider abdominoplasty? The best long term results are achieved when you have finished shedding any pregnancy weight you might wish to lose; this will ensure an ideal abdominal contour and the longevity of your outcome. At certain times of year, there can be a significant wait to see an experienced, qualified plastic surgeon in Brisbane or Ispwich, so we recommend contacting surgeons about 6 months before your ideal surgery time frame, to avoid the disappointment of missing out on your ideal surgery time frames - especially as many mothers base their surgery around work or school holidays. Choosing the right surgeon for you is important so it’s important not to feel rushed or make a decision based purely on how quickly you can obtain a consult. If’s a life long decision, so we recommend investing in consults with at least two plastic surgeons, to find one that resonates with you. Is it possible to combine an abdominoplasty with breast surgery? Yes, this is one of the most common surgical combinations we see in our clinics, and something Dr Sharp frequently performs. Breast augmentation, reduction or lift alongside abdominoplasty are the most common combined postpartum procedures. The main benefit of combining the procedures includes a single recovery period (so less downtime). Drawbacks include increased costs (due to the longer time spent in theatre) and possibly slower recovery and healing as your body is trying to recover from two procedures instead of one. Dr Sharp spends lots of time going through your informed consent documentation and stepping through these procedures during your pre operative consultations. It’s important to consider the pros and cons, and ask lots of questions. Not all patients feel comfortable with their photos being shared online, but if combined tummy tuck and breast surgery is is a procedure you are interested in having, ask Dr Sharp to see more photos in-clinic during your consultation. Some of our team members have had this procedure, so feel free to ask them questions. above: before and five months after abdominoplasty and breast augmentation surgery with Dr Sharp. This is a classic ‘mummy makeover’ post pregnancy combined procedure. Yes, this is one of the most common surgical combinations we see in our clinics, and something Dr Sharp frequently performs. Breast augmentation, reduction or lift alongside abdominoplasty are the most common combined postpartum procedures. The main benefit of combining the procedures includes a single recovery period (so less downtime). Drawbacks include increased costs (due to the longer time spent in theatre) and possibly slower recovery and healing as your body is trying to recover from two procedures instead of one. Dr Sharp spends lots of time going through your informed consent documentation and stepping through these procedures during your pre operative consultations. It’s important to consider the pros and cons, and ask lots of questions. Not all patients feel comfortable with their photos being shared online, but if combined tummy tuck and breast surgery is is a procedure you are interested in having, ask Dr Sharp to see more photos in-clinic during your consultation. Some of our team members have had this procedure, so feel free to ask them questions too. What does abdominoplasty surgery treat? muscle separation:learn more about rectus divarication or abdominal muscle separation here. Is postpartum abdominoplasty vain or selfish? mums selflessly spend years of their lives putting others first; emotionally, physically and financially. At some point, it’s healthy to start thinking about yourself, and what you want. it’s your body - and provided you are of sound mind - nobody else has the right to choose what you do with your own body (it’s not 1800’s folks. Is it possible to combine an abdominoplasty with a c-section delivery? Unfortunately no, although we do understand the convenience of one anaesthetic, a single recovery period while you have support at home and less total downtime. While this procedure is occasionally performed immediately post birth for rare reconstructive reasons, it is clinically (and aesthetically) advisable to wait until your body has recovered from pregnancy and birth. What recovery is involved after post pregnancy tummy tuck? You won’t be able to do much for the first two weeks, so be prepared to have assistance with basic tasks like driving, carrying small children, cooking and household activities! Even getting out of bed will be difficult, as will dressing and sleeping - especially if you are a side or stomach sleeper - so make preparations to reduce demands around the home that may compromise your recovery or state of mind during your initial healing process. After two weeks you will still feel quite tight and some movements will feel uncomfortable, so if you are returning to work at this stage, make sure you are limited to sitting and sedentary tasks. You can’t lift anything over 2kg for the first 6 weeks, nor can you attend the gym or start back running/jogging. Doing so will compromise your results. Taking it easy, wearing your support garment (which is like an abdominal binder) and adhering to the detailed post operative instructions that Dr Sharp provides after your surgery is integral to a good outcome. Physical activity can be integral to mental wellness, which can suffer during the post op period. Our clinics have partnered with experienced personal trainers to provide safe, tailored post op activities that provide a physical outlet without jeapordising results; talk to us if you would like further information. After 6 weeks you will see Dr Sharp and he will let you know which activities you can return to, gradually easing back into normal load-bearing and lifting. Can I claim Medicare or private health insurance rebates for tummy tuck surgery after pregnancy? Unfortunately despite research demonstrating clear medical benefits for women who suffer from rectus diastasis (muscle separation), chronic back pain, urinary incontinence, hernias and excessive redundant skin after pregnancy, in late 2015 the government removed this procedure from the MBS for postpartum women. That means that currently, neither Medicare or private health funds will provide rebates for the surgeon’s fee, hospital fees or anaesthetic fees for tummy tuck surgery if you require it for surgical reconstruction following pregnancy. The only patients who are now eligible for this procedure with MBS item number coverage are massive weightloss patients who have had a BMI drop of 5 points or more. Is it safe to have post pregnancy abdominoplasty surgery overseas? Many of the abdominoplasties performed overseas as part of the ‘cosmetic tourism’ (or cut-price surgery) industry occur without complications; and that’s great. But plastic surgeons in Australia have spoken out about the invisible side of the industry, which includes patients that are too embarrassed or traumatised to discuss their complications, difficulty contacting their surgeon and high costs of revisional surgery. But we believe that women - especially mothers, who want only the best medical care for their loved ones - also deserve the best for their own bodies. And we believe the best way to ensure optimal post operative care and support is to have abdominoplasty surgery close to home with a RACS qualified plastic surgeon that has the letters ‘FRACS’ after their name. Why? Because Australia boasts extremely high surgical training and nursing standards. We also have regulations and compliance requirements that ensure our hospitals are of a very high standarts. Our Medical Board and peak industry bodies hold surgeons to strict codes of conduct. And if your post operative recovery is in any way impacted by seromas, haematomas, slow healing, infection or undesirable scarring, your surgeon is close by to monitor, assess and provide optimal care to ensure the best possible long term result for you. That’s why we believe every mothers’ body deserves a FRACS qualified plastic surgeon.